Who's Going to be Quizzed? All GodsWar Online players that would like to participate may do so. 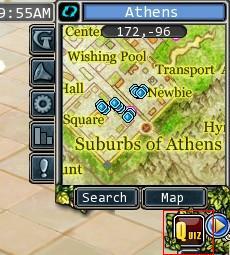 Click on the Quiz button at the bottom right corner of the mini map to get started. Each section of quiz, in Individual Mode, consists of 10 questions of varying difficulty, followed by a recess of 1 hour before the next section becomes available. All questions are multiple choice, with 4 answers to choose from provided. Just choose the one that best fits the question by clicking on the corresponding button - either A, B, C or D. Each correct answer will earn you a certain amount of Exp and Talent as a reward, while each incorrect answer will only give you half of the expected reward for that question. Also note that there is no option to skip or pass on a question. (1) Contest Mode will be activated twice a day, once at 0:45pm(EST) and again at 7:45pm(EST). This will be obvious, as the Quiz button will begin blinking when its time. Players who happen to be in the middle of an individual mode quiz at that time will be automatically directed to Contest Mode, and will be switched back to the Individual Mode quiz they left unfinished afterwards. 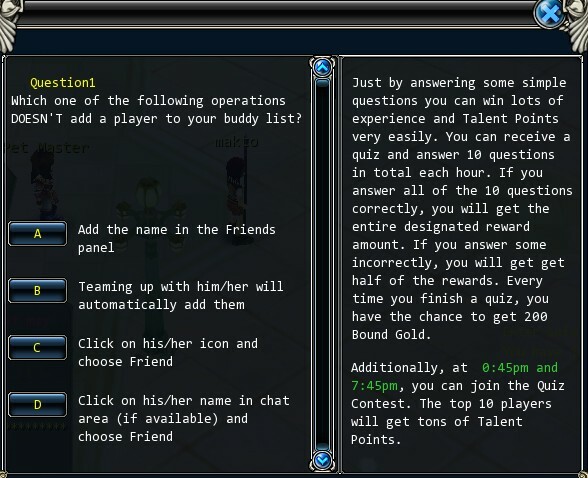 (2) One session in Contest Mode consists of 30 questions, with the time available to answer being limited to 30 seconds. Also, the less time it takes you to answer a question, the higher your score will be. An incorrect answer earns you nothing. At the end, a certain amount of Exp and Talent is then rewarded based on the score. (3) A uniform session of 30 problems will be adopted for one server. There is a Score panel to the right of the quiz window, that will be continually refreshed with the latest rankings of the highest scores. The top 10 scores, across each server, will be rewarded with a huge amount of Exp and Talent! The champion from each session will also obtain a special title that will fill you with pride and inspire envy in your rivals - Rhodes Scholar. Lastly, don't wait too long after a quiz to collect your rewards, there is only a 5 minute window for prizes to be collected, after which they will be forfeit.